This was probably the best shot of the day, but it's still somewhat obstructed by leaves. Monday was my first day off recently that wasn't supposed to be drenched. 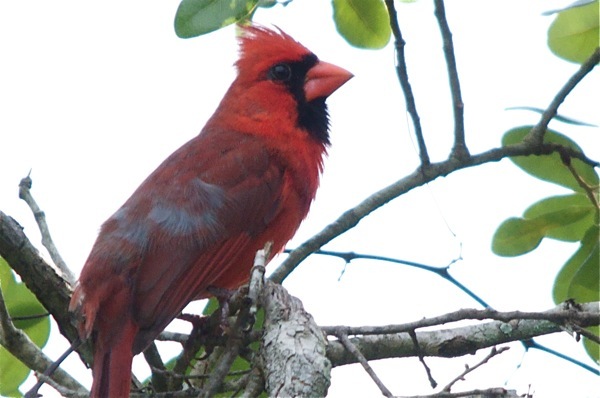 Last weekend, I meant to venture outside and snap a few more shots of cardinals, but the weather didn't cooperate. On Monday, my brain didn't cooperate. 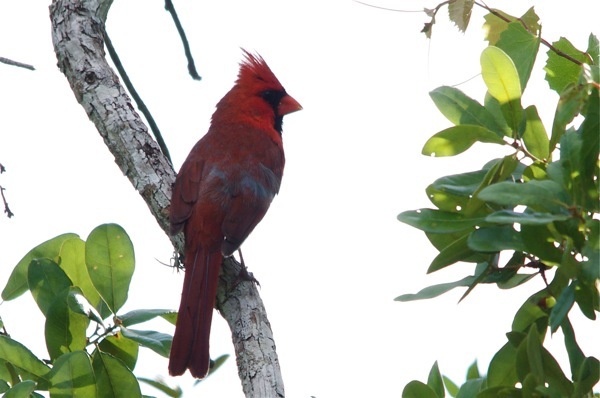 I drove 30 minutes south to Palm Bay's Turkey Creek Sanctuary, where I photographed my first cardinal weeks ago. After arriving and pulling out my camera, I realized that I had left the battery sitting in its charger at home. No juice, no photos. I returned Tuesday, yet another fair-weather day, with a fully charged battery. 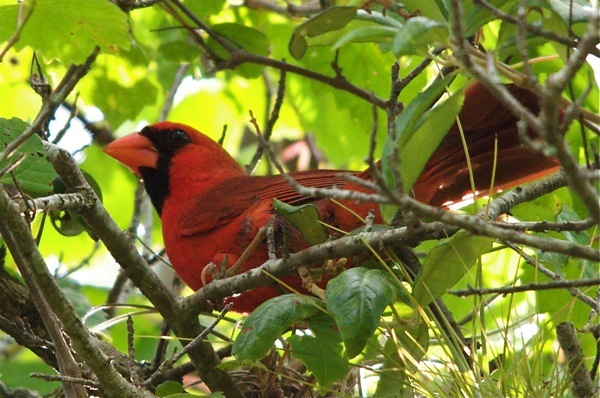 And the cardinals, for the most part, cooperated. In fact, they were everywhere. Ironically, however, that was the problem. In my best opportunity to shoot a cardinal, the bird was too close. 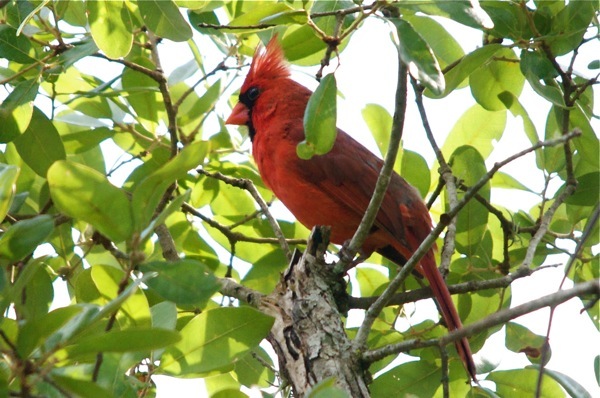 Most of the cardinals in the sanctuary perch in the trees along a boardwalk, singing songs and communicating with each other. One of them, though, was interested in a ground-based food source beside the boardwalk. The cardinal scavenged the ground only feet away. My 150-500mm Sigma lens, however, is incapable of focusing so closely. The shots I did get were probably the best considering the amount of light available. I can't expect much better from my lens. As the afternoon wore on, dark clouds became visible on the horizon. A storm was coming, and the birds knew it. They started chirping and flying over the boardwalk. For a photographer trying to chase them, it was a bit overwhelming. 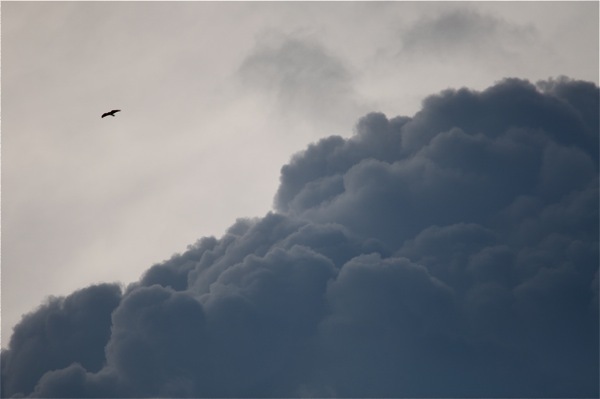 But alas, the storm clouds were too dark, and the conditions for shooting the birds deteriorated rapidly. After looking up and seeing a well-defined cloud bank, which would have made for an excellent shot, I started running for my car. By the time I reached the parking lot and replaced my telephoto lens with a wide angle, it was too late. If I had brought the wide angle along for the cardinal hunt, I would have captured an excellent cloud photo and an excellent close-up of the cardinal foraging on the ground. But there's no sense in dwelling on what could have been. These are a few of the other shots I did get. I had my lens trained on this guy for a while. Because it was almost directly above me, it became quite a pain in the neck. Some shots came out overexposed in the background, only because I was trying to pick up the details and colors of the bird. 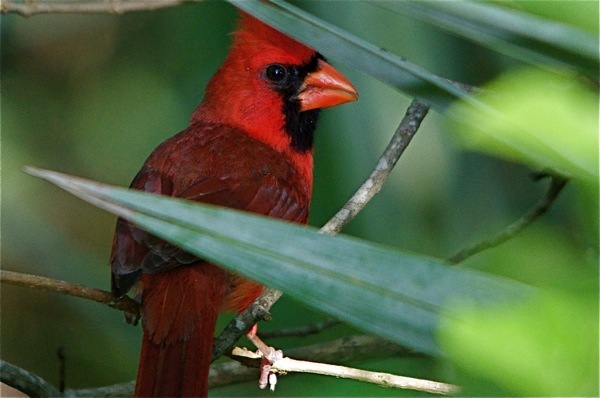 Light shines through the leaves to illuminate this cardinal's face and feet. 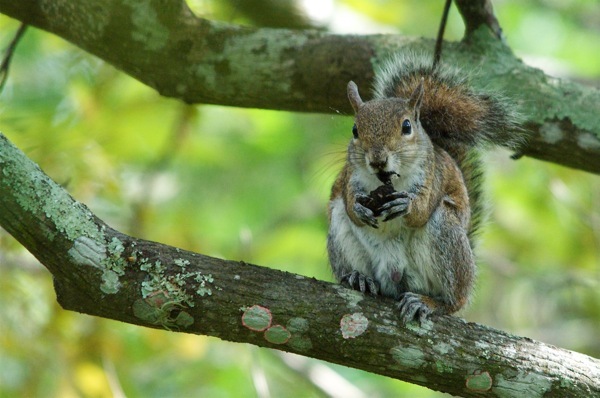 As were the cardinals, squirrels were having a ball chowing down. 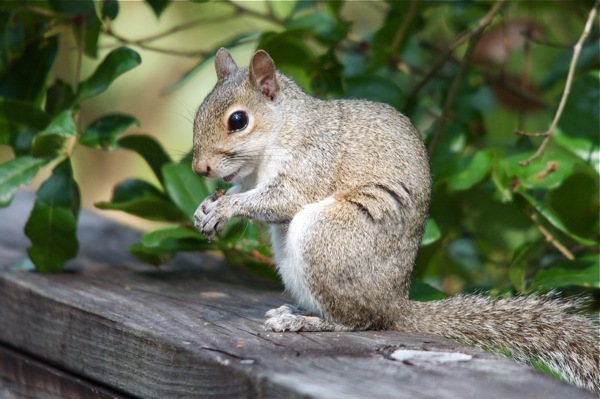 This squirrel is using the boardwalk railing as a dining table. The clouds cometh - and ruinith my day of bird photography.